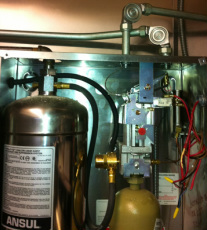 Is your hood cleaning company really doing complete cleaning of your kitchen exhaust system?. Do they clean exhaust duct & fan as well ?. Are they provide hood cleaning pictures to you? 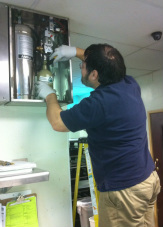 Many restaurant and commercial kitchen exhaust cleaning companies do not clean exhaust fan and duct work. They will spend their time and energy on cleaning filters, plenum area and outside of hood. We highly recommend commercial kitchen owners to check their complete kitchen exhaust system to make sure that cleaning is done properly. As you see in left side picture that exhaust fan is missing grease trap box. And the stainless steel container is upside down which won't help. Not every hood cleaning company cleaning have enough experience, high tech cleaning tools, good quality hot and cold pressure washer and fully trained employees to clean the exhaust to bare metal. If kitchen exhaust duct is not being cleaned properly grease accumulation will start building up quickly in duct work, exhaust fan and on fan blades. Which will affect exhaust's air flow operation and excessive grease in duct can cause a disaster in case of fire. As you see grease build up in hood duct and how it looks after scraping and during steam cleaning process. 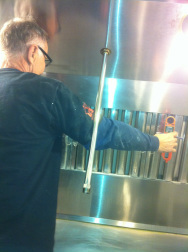 We remove grease from all accessible areas using special custom made scrapers and tools. if we find inaccessible areas we can install fire rated panels to remove rest of the grease. 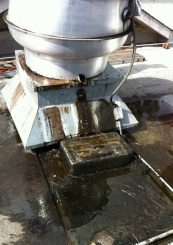 Grease accumulation in kitchen filters, duct & fan can bring exhaust fan performance down. Due to poor exhaust air flow smoke will start escaping outside the hood and you will notice kitchen room temperature rising to uncomfortable condition. It can be very uncomfortable to work in such condition especially in summer time. Kitchen hood filters, exhaust duct and exhaust fan are very important to be cleaned on timely basis. Hood filters must need to be cleaned very often. Kitchen hood & exhaust fan repair services. Kitchen exhaust fan is the heart of your exhaust system. Exhaust fan needs to be serviced on timely basis to get proper air flow from your exhaust system. 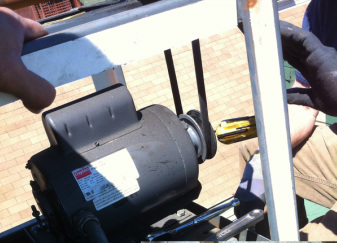 We recommend that you get your hood fan Inspected & serviced along with hood cleaning. 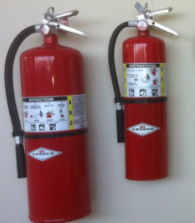 Fire Extinguisher, Fire Suppression, Hood Cleaning San Jose, Santa Clara, San Francisco, Cupertino, Campbell, Sunnyvale, Saratoga, Palo Alto, east palo alto, Redwood City, Brisbane, burlingame, Menlo Park, San Carlos, Belmont, Milpitas, Mountain View, Los Gatos, Los Altos, Gilroy, Fremont, Newark, Hayward, San Leandro, San Lorenzo, Castro Valley, Oakland, Alameda, Berkeley, Richmond, El Sobrante, Vallejo, Martinez, Concord, Pleasant Hill, Pleasanton, Walnut Creek, San Ramon, Dublin, Danville, San Pablo, Albany, El Cerrito, Piedmont, South San Francisco, Half Moon Bay, Colma, Daly City, Mill Valley, Napa county, South San Francisco, San Rafael, novato, mill valley, San Mateo, San Bruno, Santa Cruz, Watsonville, Tri County, Bay Area, Northern California, Service Areas.cfm, google, bing, yahoo.